where M and N are two natural numbers. 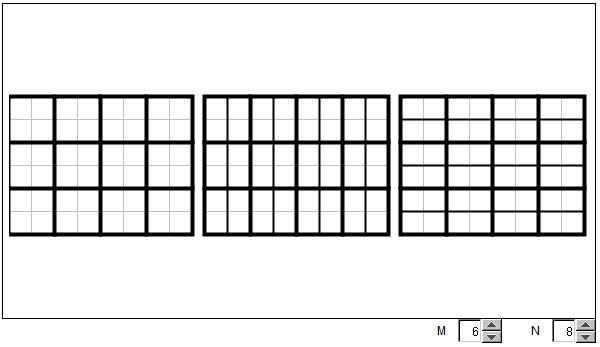 Given two (natural) numbers M and N, we may form a grid M×N rectangle. Call it R. G = GCD(M, N) can be defined as the side length of the largest square that tessellates R. Indeed, GCD(M, N) is a factor of both M and N and is the largest number with this property. Call it S = (M/G)×(N/G). Obviously, S×G = M×(N/G) = (M/G)×N, so that S×G is divisible by both M and N. Call it L = S×G. In the applet, there are two additional rectangles of the same size as R. These suggest the two ways in which L can be obtained: (M/G)×N and M×(N/G). In one, the G×G squares are split vertically into G×1 rectangles. In the other, they are split horizontally into 1×G rectangles. The total number of small rectangles in both cases is L.
N = pαqβ· ... · rγ. We see that it is always possible to write both M and N as the products of the same prime factors, albeit with different exponents. Some of the exponents will need to be zero. LCM(M, N) = p max(a, α) q max(b, β)· ... · r max(c, γ). LCM(12, 10) = 223151 = 60.